A great beginner RC plane. 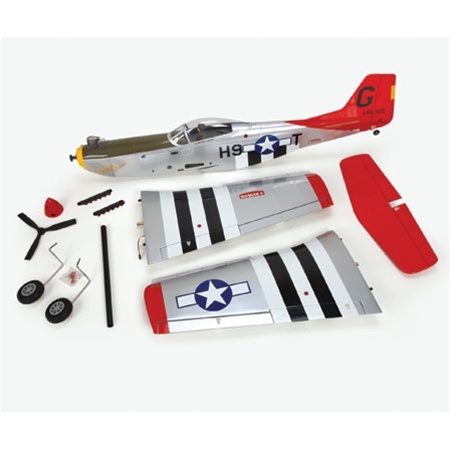 This is a beginner RC plane that is a scale P-51 Mustang! 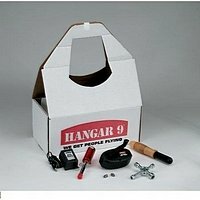 From Hangar 9 comes this completely ready to fly RC airplane. 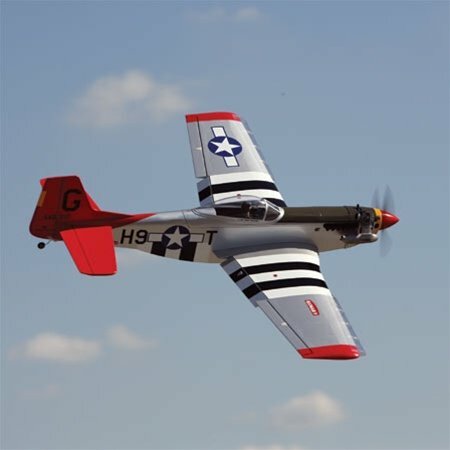 I never thought it would be possible to recommend a semi-scale P-51 as your first beginner RC plane -but now it is possible! The Mustang PTS from Hangar 9 has been specifically designed to be a beginner plane. It comes equipped with NACA "Leading Edge Droops". 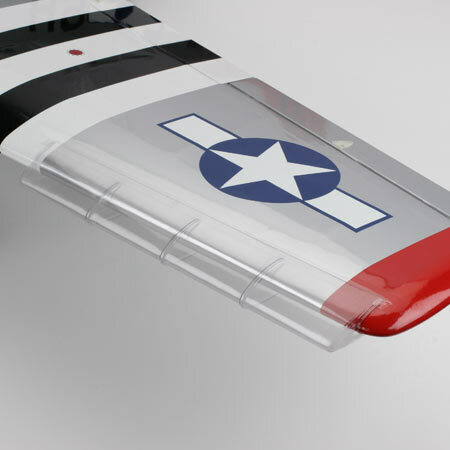 These are clear plastic pieces that act as leading edge lift devices that prevent wing tip stall. This P-51 has a large wing area and low weight, resulting in a relatively low wing loading that makes the plane easy to fly and very forgiving. I have seen beginners learn to fly, using this plane with help from a good instructor. Bare in mind that you will need a good runway, to take-off from and land. I do not recommend hand launching this beauty! To make your learning curve even shorter, the model comes as a Ready-to-Fly aircraft complete with installed glow engine and a 6 channel radio! 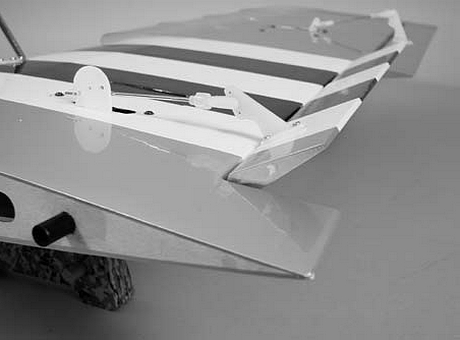 If you can use a screwdriver and a wrench then you can build this beginner RC plane! The plane is of conventional balsa and ply construction and covered with Ultracote-thus making the inevitable repairs simple. If the repairs required are extensive, then a full range of replacement parts are available from Hangar 9. Installed Evolution 45 2-stroke Glow engine. Installed 6-channel Spektrum receiver, servos, battery and switch. Take a look at the video to see this Mustang fly. 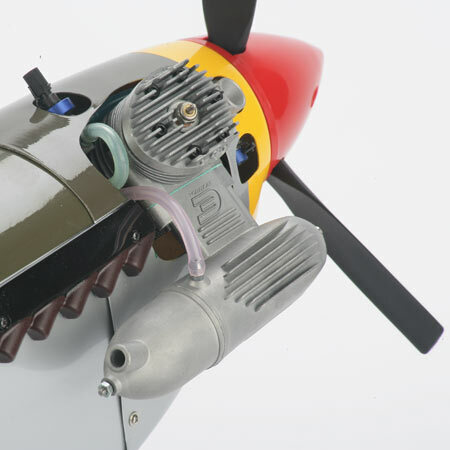 RC Airplane Engines. The Support Equipment Required. 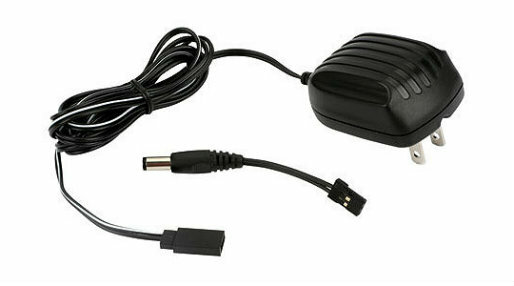 This is a wall charger, you will need, to charge the onboard 1500mAh NiMH battery of this beginner RC plane. Note from the photo that it includes a cord that allows transmitter charging as well. The RC transmitter that is included comes with dry cells. I strongly recommend that these be replaced with NiMH batteries! I would have thought that this unit, or similar, would have been included in the package. The flaps, which are adjustable, on the ground only, can be modified to a servo actuated style, when the beginner has progressed to a level that he no longer needs the PTS features. Servo hatches are already installed, on the underside of the wing. 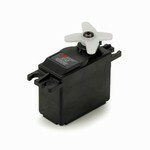 Two JR Sport servos are required and full details of the installation are given in the manual. The manually adjustable flaps, can be adjusted, on the ground only and can be set at two different deflection angles and at neutral. Please ensure that both left and right flap are set at the same angle, otherwise, this beginner RC plane will be hard to control! When the flaps are deflected, more lift and drag are created and thus the airspeed is reduced. Landing is allowed, at a slower speed. As the beginner progresses, less flap is needed until they are at zero deflection. When in this condition, this beginner RC plane acts just like a typical sport flyer and Basic RC aerobatics are possible. Watch out! When at a zero angle the Mustang may need trimming with a touch of elevator to maintain level flight. The other key feature of the PTS system, are the NASA leading edge Droops. These are made from a clear plastic material and increase the wing area, at the wing tip and improve the airflow over the wing. Once again, when the beginner has progressed, they can be removed, by removing the clear tape and then the Mustang is a typical sport scale flyer. The Evolution Engines Trainer Power System. The final feature of the PTS system, is the Evolution 0.45 glow engine. This is a basic 2-stroke glow engine that is especially set- up for the beginner. A flywheel is incorporated, at the back of the spinner, that adds inertia when starting and smoothes out the revs at idle. A 3-bladed propeller, keeps the RPM down, resulting in a reduced airspeed. (This is preferable for a beginner, as more time is available for pilot reaction). Finally, there are stops incorporated, on the needle valve, limiting how far it can be adjusted. This feature prevents the beginner from adjusting the valve way out of range and creating more problems. I would strongly suggest that you remove the cowl and take a close look at the firewall area. Note if this area has been coated with a fuel proof paint. If not, then it is well worth it to remove the engine and mount and coat the area with a clear epoxy coat. This action will prevent fuel from soaking into the firewall and significantly lengthen the life of your beginner RC plane. Have a word with your instructor and he (or she) will advise you on this and other model matters. Once you have mastered the basics, it is possible to replace the 3-bladed propeller with a 10x6 2-blade (APS is recommended). This will give a few more RPMs and a little more airspeed. Note that you will need a 2-bladed spinner. The important point regarding the PTS system, is that it is progressive. As you learn, you can move on to the next step and continue on until all the training features have been removed and you finish up with a very nice sport scale Mustang, that is fully capable of all the sport maneuvers. This is in direct contrast with the usual trainer type of RC plane. With the conventional trainer you must purchase a new model to appreciate the features you finally have with this beginner RC plane! As the photos on this page show, this beginner RC plane comes to you completely finished and ready to fly. Even the RC transmitter is included. 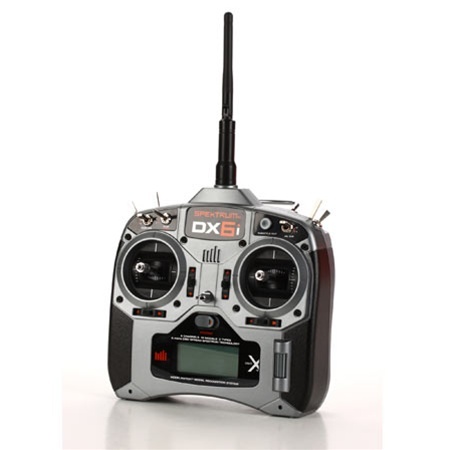 This unit is a Spektrum DX6i, 2.4GHz DSMX 6-channel programmable computer radio. This transmitter can be used, in the future, to control many other RC airplanes. Radio interference should be a thing of the past and there is no need to wait for the frequency pin to be available! This is a 6-channel programmable RC radio with a 10 model memory. It includes airplane and helicopter programming and has many features only found on more expensive transmitters. Servo reverse, integrated timer, sub-trim, programmable dual rates and exponential throw are just a few of the features to wet your appetite! This is a first class transmitter, that should last you for many years and many future models. 100% built and just requires simple assembly. Excellent manual that includes many photos and first class instruction. Although a tail dragger, wide stance landing gear makes ground handling a pleasure. The Progressive Trainer System really works and results in a very easy, to learn to fly, airplane. PTS system is removable and then you have a first class sport scale airplane that can do all of the basic RC aerobatics. No charger supplied for airborne battery pack. Horizon should have included one! Does need extra support equipment (See above) Note that this equipment should last you for years! After reading some 27 reviews of this beginner RC plane, it was very hard to find any negative comments! One person installed the servo operated flaps, at the beginning and crashed on the first flight! So leave it until you have some experience and then try the feature at altitude. to see how the plane reacts. There were some problems noted re the engine quitting. Make sure you have tuned it correctly, prior to flying. Your instructor can help here! A loose tail assembly was noted by a few flyers. Use blue thread locker on all screws and if the problem persists, then consider gluing the tail permanently in position. For those who did have problems, the customer service available from Horizon Hobby was first class! There were many positive comments on the durability of the airplane- a very desirable feature when leaning to fly! This beginner RC plane represents excellent value for money and Horizon should be congratulated on designing such a super looking trainer! Many people said it could not be done but it has been around for a while now and has proven to be a first class training system. We are sorry to say that Horizon Hobby have decided to withdraw this airplane from their range and it is no longer available.